Prototype: Type Sggrss 6-axle double container transport car with articulation, for combined freight service. Orange basic paint scheme. Privately owned car for Wascosa AG, Lucerne, Switzerland, registered in Germany. Loaded with three (3) 20-foot tank containers. The car looks as it did around 2011. Model: The car has prototypically partially open flat car floors constructed of metal with striking "fish belly" side sills. It also has type Y 25 trucks. 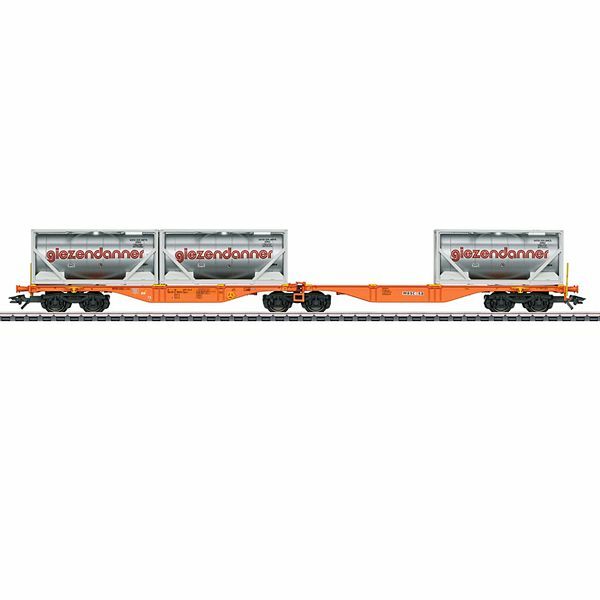 Both flat car halves are mounted on the center truck and can pivot. The underside of the flat car floors has separately applied brake lines and air tanks. There are folding walkover plates on the upper side of the flat car floors above the center truck in the area of articulation. The grab irons on the ends of the car and switching hooks are separately applied. The car is loaded with three (3) 20-foot tank containers that can be removed. Length over the buffers 30.7 cm / 12-1/16". DC wheelset E700580. Tank containers can be removed and stacked. Additional double container transport cars to form unit trains can be found under Märklin item numbers 47806, 47808 as well as Trix item number 24802.